Découvrir la ville unique, patrimoine de l'UNESCO dans ce lumineux, récemment rénové, loft, de style. Vous ne manquerez rien de l'action assis sur la grande terrasse ensoleillée avec vue sur le port de Lunenburg et le Bluenose II. Que ce soit les allées et venues des goélettes majestueuses; les courses de doris ou voilier; l'arrivée de nouveaux navires qui sont venus de loin; ou tout simplement l'activité quotidienne du port; tout se passe sur le quai Bluenose. Les boutiques, restaurants et galeries d'art sont à seulement quelques pas ou autour du coin. Après avoir dîné dans l'un des nombreux restaurants ou familiales, vous pouvez marcher dans les rues, chargés d'une histoire fascinante et découvrir l'architecture intrigante qui donne Lunenburg son charme spécial. Les belles plages ne sont qu'à une courte distance en voiture, soit avec des eaux calmes pour les tout-petits ou surfer ondulée offrant la jouissance sans fin pour les adolescents et les sortes les plus aventureux. Les étés dans la ville sont remplis de musique, d’art et de festivals de rue. Notre appartement au 2ème étage ci-dessous est également disponible à la location. Cette unité autonome fournit 2 chambres supplémentaires (4 personnes) avec cuisine complète et salon. Si vous êtes un groupe plus important, nous pouvons vous proposer les deux unités et accueillir confortablement jusqu'à 10 personnes. The apartment was charming, private,clean and comfortable. The kitchen was well stocked for cooking great seafood! 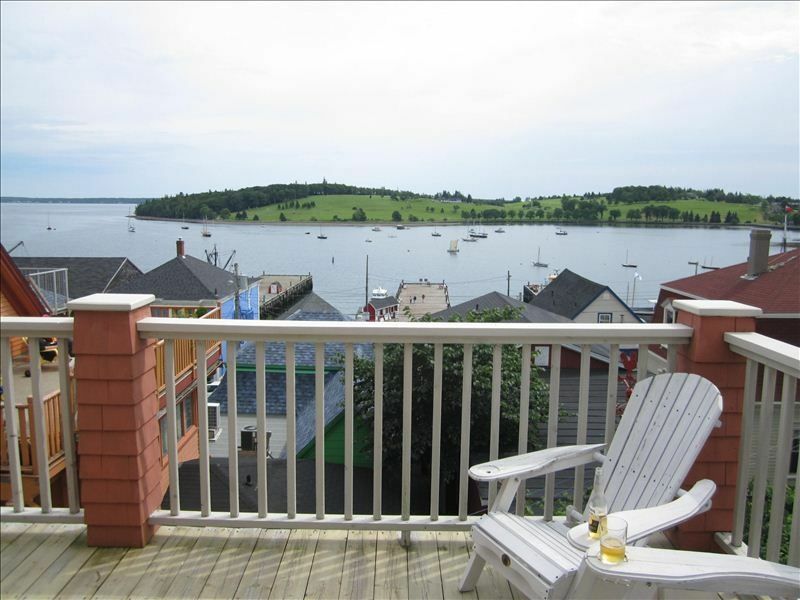 The location was excellent, right in the heart of old Lunenburg. Thank you very much for sharing your home with us. That's what we had to keep telling ourselves during our 3 night stay with Irma and Richard. Just sitting on the deck and taking in the beauty of the bay is reason enough to stay here. Nothing fancy, yet all 2 or 3 people would need for a comfortable stay (may be a bit crowded for 4 adults). Irma was very accomodating, meeting us upon arrival, familiarizing us with the apartment and the area, and being available to provide an occasional answer to a question. We have done many VRBO stays, and this one is certainly in the top group. The Bluenose II ship is the centerpiece of Lunenburg Bay and you have a fabulous view of the ship and pier from your 3rd story deck. We watched it and many other ships enter and leave port throughout the day. While we spent the majority of our time relaxing on the deck, the house was also enjoyable. Two separate bedrooms gave us each our own space. There is also a small living room and large bathroom. The huge open kitchen was greatly stocked with everything we needed. It also had a wonderful bar where we enjoyed watching a storm one evening. The decorating was charming with adorable marine themed objects everywhere. The building is in the center of one of three of the main streets of shops, restaurants and inns. The only better view you might get would be a Harbour Street room in right down on the pier. We were able to walk everywhere and loved our home base. Our hosts (Stephen & Irma) were always available with any needs/questions we had. We never wanted to leave! Also great value for the price. Only concerns would be third floor means lots of stairs and there is no AC. You can open the windows but street noise (from the cars trying to climb the steep hills) was pretty loud. We'd recommend to anyone and we hope to be back! Beginning with the only weak area is the stairs. I don't know why I didn't consider that Lunenburg is built on a steep grade - duh! But as a 60 yr old woman who has some joint problems, coming from the waterfront and up the steep sidewalks, by the time that I started climbing the stairs to the 3rd floor loft, I thought I might die. If you have knee, foot or hip problems, it becomes necessary to plan your day so you aren't returning frequently. Everything about this apartment is pleasing to the eye. We brought 2 grandchildren ages 9 and 11 and we found ourselves extremely content here. The location was perfect. Endless opportunities to explore and dine. We could see the Bluenose from the deck and watched it go out - WOW. Together we snapped 500 photos from the deck and they are all masterpieces suitable for framing. The kitchen is nicely set-up for cooking with plenty of room. Though we didn't use it, it was nice to have a washing machine available. We had a great sense of being welcome in this well-thought-out rental unit. I plan to return. Spent a wonderful three days here - very comfortable and relaxing - owner extremely helpful.